Lego System A/S, doing business as The Lego Group (stylised as The LEGO Group), is a Danish toy production company based in Billund. It is best known for the manufacture of Lego-brand toys, consisting mostly of interlocking plastic bricks. The Lego Group has also built several amusement parks around the world, each known as Legoland, and operates numerous retail stores. The company was founded on 10 August 1932 by Ole Kirk Christiansen. The word "lego" is derived from the Danish words "leg godt", meaning "play well". In the first half of 2015, The Lego Group became the world's largest toy company by revenue, with sales amounting to US$2.1 billion, surpassing Mattel, which had US$1.9 billion in sales. On 11 August 2017, Lego announced that Niels B. Christiansen would become the new CEO, effective 1 October of the same year. The history of Lego spans nearly 100 years, beginning with the creation of small wooden playthings during the early 20th century. Manufacturing of plastic Lego bricks began in Denmark in 1947, but since has grown to include factories throughout the world. In 1961, Lego was managed by Samsonite until 1972 in the United States and 1986 in Canada. Below are historical images of the Lego logo throughout the company's existence. Since the expiration of the last standing Lego patent in 1989, a number of companies have produced interlocking bricks that are similar to Lego bricks. The toy company Tyco Toys produced such bricks for a time; other competitors include Mega Bloks and Best-Lock. These competitor products are typically compatible with Lego bricks, and are often marketed at a lower cost than Lego sets. One such competitor is Coko, manufactured by Chinese company Tianjin Coko Toy Co., Ltd. In 2002, Lego Group's Swiss subsidiary Interlego AG sued the company for copyright infringement. A trial court found many Coko bricks to be infringing; Coko was ordered to cease manufacture of the infringing bricks, publish a formal apology in the Beijing Daily, and pay a small fee in damages to Interlego. On appeal, the Beijing High People's Court upheld the trial court's ruling. In 2003, The Lego Group won a lawsuit in Norway against the marketing group Biltema for its sale of Coko products, on the grounds that the company used product confusion for marketing purposes. Also in 2003, a large shipment of Lego-like products marketed under the name "Enlighten" was seized by Finland customs authorities. The packaging of the Enlighten products was similar to official Lego packaging. Their Chinese manufacturer failed to appear in court, and thus Lego won a default action ordering the destruction of the shipment. Lego Group footed the bill for the disposal of the 54,000 sets, citing a desire to avoid brand confusion and protect consumers from potentially inferior products. In 2004, Best-Lock Construction Toys defeated a patent challenge from Lego in the Oberlandesgericht, Hamburg. The Lego Group has attempted to trademark the "Lego Indicia", the studded appearance of the Lego brick, hoping to stop production of Mega Bloks. On 24 May 2002, the Federal Court of Canada dismissed the case, asserting the design is functional and therefore ineligible for trademark protection. The Lego Group's appeal was dismissed by the Federal Court of Appeal on 14 July 2003. In October 2005, the Supreme Court ruled unanimously that "Trademark law should not be used to perpetuate monopoly rights enjoyed under now-expired patents" and held that Mega Bloks can continue to manufacture their bricks. Because of fierce competition from copycat products, the company has always responded by being proactive in their patenting and has over 600 United States–granted design patents to their name. Lego products are mass-produced, packaged and shipped on a large scale. Lego Produktion AG was a major production facility for Lego. It was founded in Switzerland in 1974. At the time of its announced closing in 2001, 30% of the world production of Lego was produced at the Swiss facility in Baar. The Baar facility eventually closed in 2004 with the remaining Swiss production facilities closing in 2005. Today, only the sales and finance department of Lego is located in Switzerland. Lego acknowledges the impact of its operations on the environment, in particular in areas such as climate change, resource and energy use and waste. All manufacturing sites are certified according to the environmental standard ISO 14001. The first Borkum Riffgrund 1 wind turbines off the coast of Germany began producing electricity in February 2015, which will help The Lego Group reach its goal of being based 100% on renewable energy by 2020. The company claims to recycle 90% of its waste and that it had made its operations nearly one-third more energy efficient over the five-year period ending 31 December 2013. It is seeking alternatives to crude oil as the raw material for its bricks. This results in the establishment in June 2015 the Lego Sustainable Materials Centre, which is expected to recruit more than 100 employees, as a significant step towards the 2030 ambition of finding and implementing sustainable alternatives to current materials. In 2011, Lego bowed to pressure from the environmental campaigning organisation Greenpeace, reportedly agreeing to drop supplier Asia Pulp and Paper, and pledging to only use packaging material certified by the Forest Stewardship Council in future. The environmental group had accused Lego, Hasbro, Mattel and Disney of using packaging material sourced from trees cleared out of the Indonesian rainforest. Lego partnered with the oil company Royal Dutch Shell in the 1960s, using the company's logo in some of its construction sets. This partnership continued until the 1990s, and was renewed again in 2011. In July 2014, Greenpeace launched a global campaign to persuade Lego to cease producing toys carrying the oil company Shell's logo in response to Shell's plans to drill for oil in the Arctic. Shell's PR company valued the most recent two-year deal with Lego at $116 million, and reported that Shell achieved a 7.5% worldwide sales uplift during the promotion video from Iris International. Lego announced that when the latest contract between the two companies comes to an end it will not be renewing it. As of August 2014, more than 750,000 people worldwide had signed a Greenpeace petition asking Lego to end its partnership with Shell. Lego responded saying they "expect that Shell lives up to their responsibilities wherever they operate" and that they "intend to live up to the long term contract with Shell, which we entered into in 2011." Meanwhile, Greenpeace produced a video campaigning against the Shell partnership; it received extensive press coverage and was viewed more than six million times on YouTube. In October 2014, Lego announced that it would not be renewing its promotional contract with Royal Dutch Shell but did not say when the existing deal with Shell expires. Greenpeace claimed the decision was in response to its campaigning. In January 2014, a handwritten letter to Lego from a seven-year-old American girl, Charlotte Benjamin, received widespread attention in the media. In it the young author complained that there were "more Lego boy people and barely any Lego girls" and observed that "all the girls did was sit at home, go to the beach, and shop, and they had no jobs, but the boys went on adventures, worked, saved people … even swam with sharks". In June 2014, it was announced that Lego would be launching a new "Research Institute" collection featuring female scientists including a female chemist, palaeontologist, and astronomer. The science-themed project was selected as the latest Lego Ideas winner, and was submitted by Ellen Kooijman, a geochemist in Stockholm. Lego denied claims that the set was introduced to placate criticism of the company by activists, pointing to its Lego Ideas origins. The Research Institute range sold out within a week of its online release in August 2014. The BBC's Tom de Castella reported that Kooijman was pleased with the set's final design, despite the addition of face make-up to her original proposal, and that Becky Francis, professor of education and social justice at King's College London, who had been "very, very disappointed" by Lego Friends, is a fan. The Lego Group has built eight amusement parks around the world, each known as Legoland. Each park features large-scale Lego models of famous landmarks and miniature Lego models of famous cities, along with Lego themed rides. The first Legoland park was built in Lego's home town of Billund in Denmark. This was followed by Legoland Windsor in England, Legoland California in Carlsbad, US and Legoland Deutschland in Günzburg, Germany. In addition, Legoland Sierksdorf was opened in 1973, but soon closed in 1976. In July 2005, the Lego Group announced that it had reached a deal with private investment company the Blackstone Group to sell all four parks for €375m to the Blackstone subsidiary Merlin Entertainments. Under the terms of the deal, The Lego Group would take a 30% share in Merlin Entertainments and positions on their board. The sale of the theme parks was part of a wider strategy to restructure the company to focus on the core business of toy products. In 2010, Merlin Entertainments opened the first Legoland water park at the Legoland California site. On 15 October 2011, Merlin Entertainments opened their first new Legoland park, Legoland Florida, in Winter Haven, Florida. It is the largest Legoland opened to date at 145 acres, and also only one of the Legoland parks opened in the United States. The other Legoland (opened at a later date) water park was opened near the same location on 26 May 2012 after only 4 months of construction. Merlin Entertainments opened their second new Legoland park in Nusajaya, Malaysia under the name Legoland Malaysia on 22 September 2012. It is the first Legoland in Asia and was quickly followed by another Lego-themed water park in the same area. The first Lego hotel has also opened near the site. People who stay in the hotel will also get tickets to the theme park and water park. Merlin Entertainments has also planned several new Legoland parks: Legoland Dubai, Legoland Nagoya (scheduled to open in 2015), and Legoland Korea (also scheduled to open in 2015). In addition, they have opened four new Legoland Discovery Centres, which take the Legoland concept and scale it down to suit a retail park environment. The Lego Group operates 138 retail stores (83 in the United States, 14 in the United Kingdom, 11 in Germany, 10 in Canada, 7 in France, 2 in Spain, 2 in Austria, 2 in Italy, 2 in Serbia, 2 in Denmark, 1 in Belgium, 2 in China, 1 in Sweden, 1 in Poland, 1 in India, 1 in Lithuania and 3 in Mexico.). In 1992, when the Mall of America opened in Bloomington, Minnesota, one of its premier attractions was the Lego Imagination Center (LIC). An imagination centre is a large Lego store with displays of Lego sculptures and a play area with bins of bricks to build with. The store inventory includes a large selection of Lego sets for sale, including sets which are advertised in Lego catalogues as "Not Available in Any Store." A second imagination centre opened at the Disney Springs (formerly Downtown Disney) at Walt Disney World Resort in Orlando, Florida. Between 1999 and 2005, Lego opened 24 further stores in North America in 23 states. As of 2016, there are 90 Lego stores operating or soon-to-be operating in North America in 32 US states and five Canadian provinces. These stores sell various Lego merchandise, including minifigures, Pick-a-Brick, and custom packaged minifigures. The first Lego store in India was opened in Chennai, Tamil Nadu in March 2014 by Funskool, under licence from the Lego Group. Lego Interactive (formerly Lego Media and later Lego Software) was the video game publishing division of The Lego Group. The company was founded as Lego Media in 1996 and headquartered in London, England. In February 1999, Lego Media announced their move into the girls' software industry, starting with Lego Friends. Eventually, The Lego Group opted out of the video game business and Lego Interactive was shut down. Former Lego Interactive staff opened Giant Interactive Entertainment, which later became part of TT Games. Lego Media also operated a motion picture division, which produced the BBC children's series Little Robots for Cosgrove Hall Films. In 2003, this division was rebranded to Create TV and Film Limited, and became independent from The Lego Group under Lego's majority owner Kirkbi A/S, which allowed Create TV and Film to branch onto other projects. The company later produced Bionicle: Mask of Light, Bionicle 2: Legends of Metru Nui and Bionicle 3: Web of Shadows for Creative Capers Entertainment. In 2005, Kirkbi A/S sold Create TV and Film to its chief executive officer, Vanessa Chapman, and the company was renamed Create Media Ventures Limited. The sale included Little Robots but excluded the Bionicle movies, which were retained by The Lego Group. Lego factory in Kladno, Czech Republic, established in 2000. 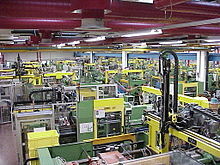 This is one of several sites in the world where Lego toys are manufactured (Denmark, Hungary, China and Mexico are the others). In 2003, The Lego Group faced a budget deficit of 1.4 billion DKK (220 million USD at then current exchange rates; equal to EUR 175 million), causing Poul Plougmann to be replaced by Kjeld Kirk Kristiansen as president. In the following year, almost one thousand employees were laid off, due to budget cuts. However, in October 2004, on reporting an even larger deficit, Kristiansen also stepped down as president, while placing DKK800 million of his private funds into the company. In 2005, The Lego Group reported a 2004 net loss of DKK1,931 million on a total turnover, including Legoland amusement parks, of DKK7,934 million. For 2005, the company returned a profit of DKK702 million, having increased its revenue by 12% to DKK7,050 million in 2005 against DKK6,315 million in 2004. It also cut expenditures and disposed of amusement parks and a factory in Switzerland. In 2011, sales for the company grew 11%, rising from $2.847 billion in 2010 to $3.495 billion in 2011. Profit for 2011 fiscal year increased from $661 million to $776 million. The increased profit was due to the enormous popularity of the new brand Ninjago, which became the company's biggest product introduction ever. In 2012, it was reported that The Lego Group had become the world's most valuable toy company ahead of Mattel with a value at over $14.6 billion. The Lego Group delivered a turnover of DKK14,142m in the first half of 2015 with an increase of 18% compared with the same period in 2014 measured in local currency (i.e. excluding the impact of foreign exchange rate changes). Net profit for the first half of 2015 was DKK3,553m compared with DKK2,715m for the first half of 2014. First half-year sales were driven by double-digit growth across all geographical regions and strong product innovation on themes such as Lego Ninjago, Lego Elves and Lego Creator. The Lego Group announced on 4 September 2017 its intention to cut 1,400 jobs following reduced revenue and profit in the first half of the year, the first reported decrease in 13 years. The revenue losses are due to a more competitive environment, where the company has to compete not only against its traditional competitors Mattel and Hasbro, but also against technology companies such as Sony or Microsoft as more children use mobile devices for entertainment. The job cuts account for 8 percent of the company's total work force. On May 2018, the company made it to Forbes top 100 World's Most Valuable Brands 2018 , being 97th on the list. ^ "Jørgen Vig Knudstorp". The LEGO Group. Retrieved 6 September 2017. ^ "Executive Leadership Team". The LEGO Group. Retrieved 25 November 2017. ^ a b c Trangbæk, Roar Rude (9 March 2017). "The LEGO Group reports record revenue 2016". The Lego Group. Retrieved 4 July 2017. ^ Bisgaard Vase, Kathrine (28 February 2017). "LEGO Group ranked as the 2nd most highly regarded company in the world". The Lego Group. Retrieved 19 March 2017. ^ "About Us". The Lego Group. Retrieved 9 January 2013. ^ "LEGO Group Celebrates 75-Year Anniversary". PR Newswire. PR Newswire Association. 10 August 2007. Retrieved 19 March 2016. ^ "Here's why Mattel ousted its CEO Bryan Stockton". Fortune. Retrieved 30 December 2016. ^ Finans, Ritzau. "Lego er nu verdens største". finans.dk. Retrieved 28 January 2018. ^ "The LEGO Group History". Lego. 9 January 2012. Retrieved 20 February 2015. ^ "Dual Protection for Industrial Designs Confirmed by Court". CCPIT Patent and Trademark Law Office. Archived from the original on 7 July 2012. Retrieved 9 January 2013. ^ "Jurisprudence in intellectual property law". The TeleMark. Archived from the original on 7 April 2012. Retrieved 9 January 2013. ^ "Kirkbi AG et al. v. Ritvik Holdings Inc.". Telemark. Archived from the original on 7 April 2012. Retrieved 9 January 2013. ^ "Interlego's list of design patents". Ipexl.com. Retrieved 9 October 2012. ^ "Ole Kirk Christiansen Biography: Amazing History of LEGO Company". Entrepreneur Success Stories. 7 November 2016. Retrieved 20 May 2018. ^ "Produktionsstandort Baar am Ende: Scharfe Restrukturierung im Lego-Konzern – NZZ" (in German). nzz.ch. 2 March 2001. Retrieved 20 May 2018. ^ "Preparations of shutdown of factory in Baar, Switzerland". Lego. 27 October 2003. Retrieved 20 May 2018. ^ "LEGO Group to invest 1 Billion DKK boosting search for sustainable materials". Retrieved 30 December 2016. ^ Katie, Collins (8 July 2014). "Greenpeace is right, Shell-branded LEGO is ill-judged". wired.co.uk. Conde Nast. Retrieved 8 July 2014. ^ Vaughan, Adam (9 October 2014). "Lego ends Shell partnership following Greenpeace campaign". the Guardian. Retrieved 28 January 2018. ^ "Shell & LEGO – Stop Playing with the Arctic". Greenpeace. Retrieved 1 August 2014. ^ "Comment on Greenpeace campaign using the LEGO® brand". LEGO. Retrieved 1 July 2014. ^ "This Is Why People Are So Upset at LEGO". TIME. Retrieved 11 July 2014. ^ "LEGO told 'everything is not awesome' in viral Greenpeace video". The Guardian. Retrieved 9 July 2014. ^ BBC News (October 2014). "LEGO 'won't renew' contract with Shell after Greenpeace campaign", BBC News, 10 October 2014. Retrieved 11 October 2014. ^ de Castella, Tom (6 August 2014). "How did LEGO become a gender battleground?". www.bbc.co.uk. Retrieved 30 November 2014. ^ "LEGO Group in partnership with Merlin Entertainments" (Press release). LEGO Group. 13 July 2005. Archived from the original on 15 June 2009. Retrieved 17 September 2010. ^ "PM: Legoland Malaysia to be catalyst for development". thestar.com.my. 22 September 2012. Archived from the original on 23 September 2012. Retrieved 23 September 2012. ^ "First SEA Legoland Hotel for Nusajaya". The Sun Daily. 25 April 2012. Archived from the original on 17 September 2012. Retrieved 29 April 2012. ^ "LEGO planning to build Legoland in Nagoya". Archived from the original on 31 October 2011. ^ "英 멀린그룹, 레고랜드 춘천 1억달러 투자 신고". ^ "Stores". Lego Group. Retrieved 3 October 2017. ^ "LEGO Stores Home". Stores.lego.com. Retrieved 19 February 2016. ^ Narasimhan, T E (1 September 2015). "Funskool raises its game". Business Standard. Retrieved 4 December 2018. ^ "EA and LEGO Interactive Ship Next Generation Videogame Based on Best-Selling LEGO Line: BIONICLE". The Free Library. 20 October 2003. ^ "LEGO Media International Introduces Three New Software Titles". The Free Library. 22 September 1998. ^ Slaton, Joyce (23 February 1998). "What Do Girls Want, Anyhow?". Wired. ^ a b Wallis, Alistair (9 November 2006). "Playing Catch Up: Traveller's Tales' Jon Burton". Gamasutra. ^ "little robots tv series". mikebrownlow-wix. ^ Ball, Ryan (21 January 2003). "New Identity for LEGO Media". animationmagazine.net. ^ "Create TV & Film Defines New Management Structure". Animation World Network. ^ Cozens, Claire (23 July 2003). "BBC denies that Lego link breaches code" – via www.theguardian.com. ^ Ball, Ryan (22 March 2004). "Cartoon Network Grabs BIONICLE Movie". animationmagazine.net. ^ Ball, Ryan (18 February 2005). "Create TV & Film Under New Ownership". animationmagazine.net. ^ Frien, Bastian (21 August 2012). "The Disguised Dane. Available Online. Accessed on May 4, 2012". Cfo-insight.com. Archived from the original on 23 September 2015. Retrieved 9 October 2012. ^ Author : Roar Rude Trangbæk (1 March 2012). "LEGO Group sales up by 17% in 2011". Aboutus.lego.com. Retrieved 9 October 2012. ^ Metcalf, Tom (13 March 2013). "LEGO Builds New Billionaires as Toymaker Topples Mattel". Bloomberg. Retrieved 15 October 2013. ^ "18 percent global sales growth in the first half of 2015". Retrieved 30 December 2016. ^ a b Kottasová, Ivana (5 September 2017). "Lego slashes 1,400 jobs as sales slump". CNNMoney. Retrieved 6 September 2017. ^ Tsang, Amie (5 September 2017). "Lego Will Cut 1,400 Jobs as Profit Dips, Despite Big-Screen Heroics". The New York Times. ISSN 0362-4331. Retrieved 6 September 2017. This page was last edited on 15 April 2019, at 15:10 (UTC).